A proposal to send used nuclear fuel to West Texas didn't end last year, but it did stall during a trip to corporate purgatory. Now a joint venture called Interim Storage Partners LLC has the plan moving forward again. 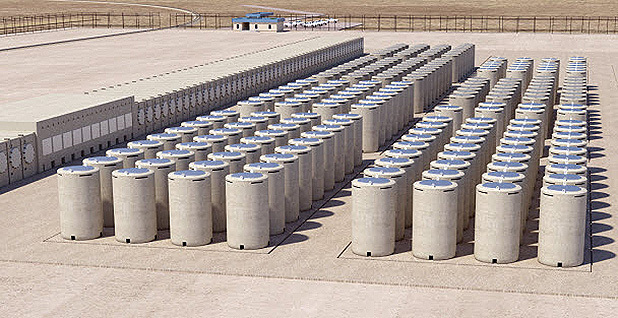 The Nuclear Regulatory Commission recently restarted its review of a consolidated interim storage application for a site in Andrews County, Texas. And the NRC staff's safety, security and environmental reviews could be finished in summer 2020. Critics are worried about what's brewing. They're asking questions and hoping for more public meetings. Some would like to halt the project. One of the chief opponents knows the proposal won't be easy to stop, but she's working to rally Texans and others against the plan. "Most people don't even know this is happening," said Karen Hadden, executive director of the Texas-based Sustainable Energy and Economic Development Coalition. "The public is unaware, and they're unaware of the risks that they are about to be exposed to." The project is another flashpoint in a long-running debate over nuclear energy and associated waste after a number of U.S. nuclear plants stopped producing power or announced plans to close. Congress has considered legislation that could help pave the way for interim storage facilities in Texas and New Mexico as well as a longer-term site at Yucca Mountain in Nevada. Hadden has voiced concern about those three sites and potential plans to transport nuclear waste across the country. 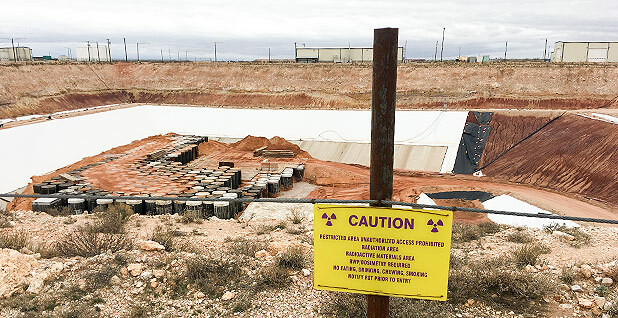 The spent fuel storage plan for West Texas is tied to Waste Control Specialists (WCS), which has endured financial issues and houses low-level radioactive waste in the region. A plan by Valhi Inc. to unload WCS to EnergySolutions collapsed in 2017. Early this year, J.F. Lehman & Co. announced that an investment affiliate had acquired WCS. That was followed in March by news of a planned venture involving Orano USA and WCS (Energywire, March 19). The new Orano-WCS entity — now called Interim Storage Partners, or ISP — later sought a restart of the NRC review that was halted in 2017. In August of this year, the NRC said the revised application was acceptable but that additional information would be sought. "The NRC staff has reviewed your request and concludes that the revised license application provides information sufficient to resume its detailed review," the NRC said in a letter. Jeff Isakson, chief executive of ISP, said in a recent statement that ISP looked forward "to an energized and timely process." ISP said its venture initially is intended to store used nuclear fuel from shutdown reactor locations. That would lower the burden on U.S. taxpayers and allow sites to be redeveloped, it said. The application is for 40 years, though it could be extended by decades. ISP outlined a first phase for storing 5,000 metric tons of heavy metal, which primarily is used uranium fuel. Reaching a capacity of 40,000 metric tons would involve future license amendments. Construction and preoperational testing on the project could be finished by April 2022, according to an ISP environmental report. A license application with the NRC said Orano USA ultimately is majority owned and controlled by an entity of the French government. But ISP has said its governing officers and management board members are U.S. citizens. ISP said in a statement that the joint venture "combines the strengths of Orano's decades of expertise in used nuclear fuel packaging, storage and transportation with WCS' experience operating a unique facility serving both the commercial nuclear industry and the U.S. Department of Energy." There's a WCS information center in West Texas for people to seek more information. ISP also has a website about its plans. Much of nuclear waste critics' focus had turned to an interim storage proposal from Holtec International for New Mexico. That plan is also under review at the NRC (Greenwire, May 9). While Hadden said there was "a nice reprieve" on the West Texas proposal, she said "the threat is ever-present and on the burner now." Instead of using the proposed interim sites or Yucca Mountain, Hadden would like to see the United States pursue a new location for a permanent repository that's geologically sound and uses improved storage technology. A public step in the process for the West Texas site was evident in late August: a meeting about the emergency response plan. Representatives of the NRC, ISP and other interested parties attended in person in Maryland or on the phone. The meeting covered aspects of the response plan and gave people a chance to interact. At one point, a speaker said that "nobody lives anywhere near us." That was followed by a description of the location as "in the middle of stinking nowhere." The remarks drew laughter as well as an unhappy response from a listener on the phone who wasn't sure who made them. "There was a statement made about this site being in the middle of nowhere, and there was some snickering and giggling," said Monica Perales, an attorney. "I live in the middle of nowhere, and that's not appreciated." In an interview last week, Perales said the attitude during the meeting "made me feel as though we in West Texas are expendable." 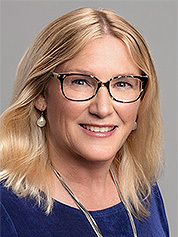 She is a staff attorney with Fasken Oil and Ranch Ltd. of Midland, Texas. Perales said the company has concerns about how the project could affect its interests in the Permian Basin. In a recent statement, ISP said Isakson led a presentation by a number of ISP presenters. "The intent of the comments was to emphasize the benefit of there being no residences within ISP's Emergency Planning Zone for nearly four miles from the site in all directions," Isakson said in the statement. He apologized on behalf of ISP for "a poor choice of words by a technical team member." And Isakson said operating safely for the region's people, wildlife and environment is a priority. Hadden sought information during the August meeting call about remediation plans if something were to happen. She was told the emergency plan establishes a framework and that more details would be developed in the future. Before the call ended, Tom "Smitty" Smith, an environmental activist in Texas who works on special projects for Public Citizen and is married to Hadden, unloaded on the NRC. "I want to point out that we're having an emergency because our regulatory agency is failing to allow citizens to ask questions that are appropriate to protect themselves," Smith said, adding: "Our mouths are being taped shut because of actions by this commission." An NRC representative said the meeting was ending due to time constraints and that some questions were beyond the meeting's scope. He said various venues are available for questions and concerns. In a statement last week, David McIntyre, an NRC spokesman, said time can run short when several people are interested in speaking during a meeting. He said the staff does its best to accommodate people who want to speak. 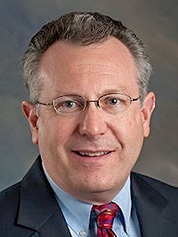 McIntyre said the public generally can participate in this sort of licensing review in three ways — during the public comment on a scoping period and a draft environmental impact statement, through petitioning for an adjudicatory hearing, and by asking questions of NRC staff during certain technical meetings. In a recent interview, Isakson of ISP said the NRC has a pretty good process to handle a license application. There's an "opportunity for the public to be involved as part of that," he said. Opponents have raised questions about the WCS site in the past and its potential effects on the environment, but ISP praised the location. ISP said the area includes a "formation of almost impermeable red-bed clay in a relatively remote, semi-arid, sparsely inhabited area." The plan to store used nuclear fuel there has seen support over the years from some leaders and residents in the region. "To fully support the continued generation of clean air nuclear energy in the United States, our nation will need multiple, flexible used fuel management resources while developing a permanent federal repository," ISP said. "Our facility will be one of those resources." A couple of key dates are approaching in terms of the NRC review of the West Texas storage proposal. Parties that wish to comment on the scope of the environmental impact statement should submit comments by Oct. 19. Previously received comments on that aspect will be considered by staff, the NRC said. Those that want to request a hearing related to the current license application should do so by Oct. 29. McIntyre noted that ISP's application and the NRC's review is specific to the storage facility. If a license were granted, he said, ISP would decide what transportation packages and routes to use. "The packages and routes would have to be approved by the NRC," McIntyre said. "ISP can choose from package designs previously certified by the NRC staff, or submit a new design for our review and approval." ISP said its license application refers to used nuclear fuel being sent to the interim storage site by rail. Existing rail infrastructure could be expanded to help accommodate such deliveries. Critics remain concerned about transportation, including the potential effects on cities and the potential for terrorists to target waste. Hadden has called for public meetings in places such as Dallas, Houston, San Antonio, Midland, El Paso and Andrews County to discuss issues related to possible interim nuclear waste storage in Texas. She's working on a public awareness campaign that's expected to take place later this month and run into October, featuring a full-scale mock radioactive waste transport cask. Hadden argued future NRC requests for additional information could bring up new issues the public should be able to examine, so NRC deadlines should be extended. Critics say there is already a new financial situation to analyze in terms of ISP's involvement. McIntyre said that once a draft environmental impact statement is completed — which could be in about a year — it would be typical to return to the region for public meetings and present draft conclusions and take public comments on the report. The Federal Register ended up running a correction regarding the date by which a hearing should be requested in the ISP proceeding — changing it to Oct. 29 from Aug. 29. That was necessary because of what McIntyre called a mistake made at the printer. Hadden saw a bigger theme at play. "That just strikes me as illustrative of the lack of attention to detail that's needed when you're dealing with radioactive waste," she said. "It's just one example that's sloppy." Questions also remain about potential congressional action that could amend the Nuclear Waste Policy Act. The House passed a bill this year to help reform U.S. nuclear waste management (Greenwire, May 10). It would need to pass in the Senate to move forward, though the outlook is uncertain. In May, the CEO of the Nuclear Energy Institute praised the House vote as a step toward implementing "the federal government's statutory obligation to manage used nuclear fuel." ISP said "clarifying" the role of DOE in used fuel management would be welcome. But the venture insists that, even without a policy change, developing a private interim storage site would give fuel owners another cost-effective option. "I think our business can go forward," Isakson said in an interview, "if the waste policy act is not changed." The ISP CEO said his company is pleased to be involved in Andrews County. And he said WCS and Orano have a strong safety culture. "There's been a long history of WCS working with the community and the community being comfortable with WCS," Isakson said. "We don't want [to] take it for granted."